Each milestone in PRIMMS® is anchored in sufficiency criteria such as shown in the figure to the right. 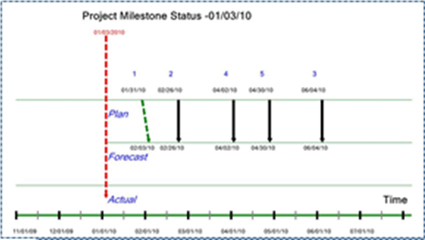 Each criterion has finish dates, and project team members update progress with forecast and actual achievement. This is the Quality Gate concept as introduced by Aaron, Bratta and Smith at PMI’s 1993 annual symposium. By viewing milestone attainment in this manner the project team and stakeholders focus upon deliverable completion and resolution of the key issues and risks. By reducing the “noise” and forcing the focus upon the critical deliverables, team productivity is enhanced. As a result milestone forecasts and recording of actual completions can be routinely made based upon performance facts. The updates made in the Quality Gate table are reflected in the milestone status reports and project metrics. Refer to the milestone slip chart as shown. Review the animated example showing why Quality Gates are important.